The $799 price point for a high end headphone can be a lonely rung on the performance ladder that you will see many manufacturers tend to shy away from when coming to market with a new product. This price point traditionally is high enough to scare away many tentative first time buyers and low enough for seasoned upper tier shoppers to pass by following their search for maximized performance. Always proud to be swimming against the current, Southern California based MrSpeakers has doubled down on this ladder rung of sorts by introducing not one but two versions of their $799 ÆON Flow series headphones—one in closed-back form and the other an open-back model. With the ÆON Flow series models Dan Clark, President and founder of MrSpeakers, is fulfilling a well known promise to his attentive community that he would deliver a first class headphone to those who must live on a reasonable budget. Following this muse the ÆON Flow series headphones were conceived to mimic as much of the performance as possible from MrSpeakers’ reputation-making ETHER ($1499) and ETHER Flow ($1799) headphones. While $799 is certainly not chump change, considering that the ÆON Flow Open edition is $1000 less than his ETHER Flow, Dan Clark certainly seems to be living up to the budget end of his promise. In regards to the quality side of the bargain the ÆON Flow closed-back was reviewed in HI-Fi+issue 147 and achieved virtually instant fame as it received our 2017 Hi-Fi+ award for High Value Headphone of the Year. It might be a good idea to re-read Chris Martens’ enthusiastic August 2017 review because the ÆON Flow Open headphone reviewed here might be an even better performer. My audition of the ÆON Flow Open happened to coincide with Valentine’s Day so as I was feeling inspired let’s start the review with love at first sight. The first thing that grabs you upon unboxing and inspecting the ÆON Flow Open is the beautifully distinctive “tear drop” shaped ear cup first introduced to the MrSpeakers family with the original ÆON Flow. This attractively shaped ear cup is constructed of an opaque thermoplastic polymer known as acrylonitrile butadiene styrene (ABS for short) and is artfully finished with a deep metallic blue lacquer that gives the headphones an understated and confident pop. The beauty of working with ABS material is when heated it liquefies (instead of scorching and burning) which makes it an ideal candidate to injection mold into a complex shape. In fact, ABS is only used in the painted plastic part that holds the grille. 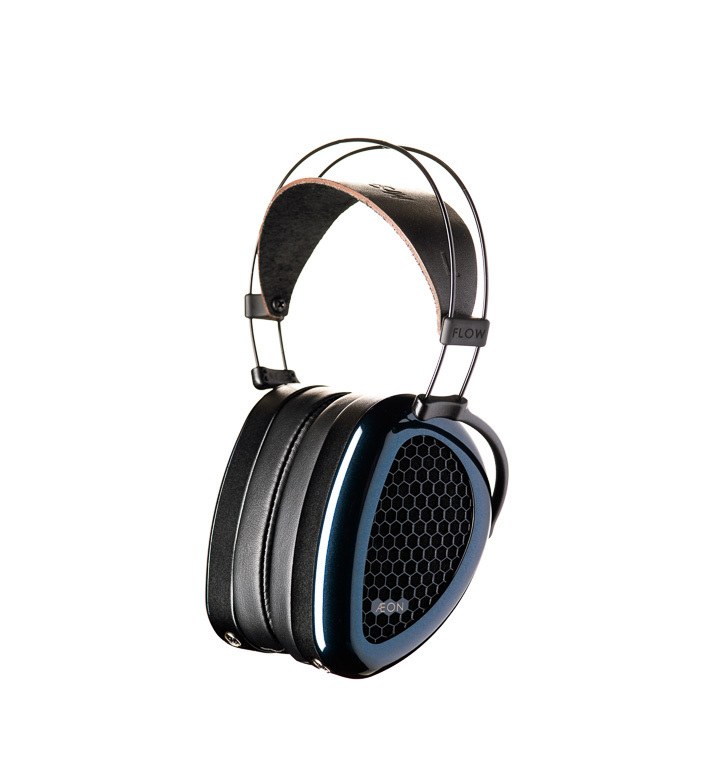 The comfort and fit are due to the gimballed NiTinol memory metal headband, which is a remarkably simple arc-shaped and hinge free design with a dyed through leather headband strap. Also accompanied by plush, bevelled synthetic leather ear pads the ÆON Flow Open effortlessly delivers a wide variety of pressure and tension adjustments. The comfort of these relatively light 321 gram headphones is not taking a back seat to any set of headphones you are going to audition any time soon, including those much further up the price ladder. The ÆON Flow signal cable is the MrSpeakers standard “DUMMER” signal cables terminated like most MrSpeakers headphones with a HIROSE connection on the headphone end. The final noteworthy design element to the ÆON Flow Open is the visually arresting hexagon-shaped powder coated stainless steel grill on the exterior of the ear cup. This grill by association reminds those familiar that the ÆON Flow Open has friends in high places like the ETHER Flow and ETHER Flow C. This hexagonal grill gives the headphone a sophisticated and sharp look that again belies its price point. In fact, according to Dan Clark, “the ‘hex pattern is actually irregular to complement the shape of the headphone. Plain hex didn’t look right.” He’s correct – when you finally are ready to stop admiring the headphones MrSpeakers again rewards you with a durable well-designed clamshell carrying case that looks and feels the part of a top tier purchase.